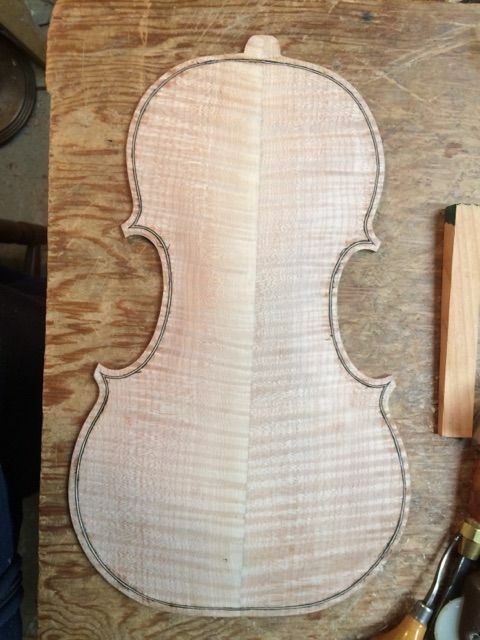 Progress as of January 2nd. 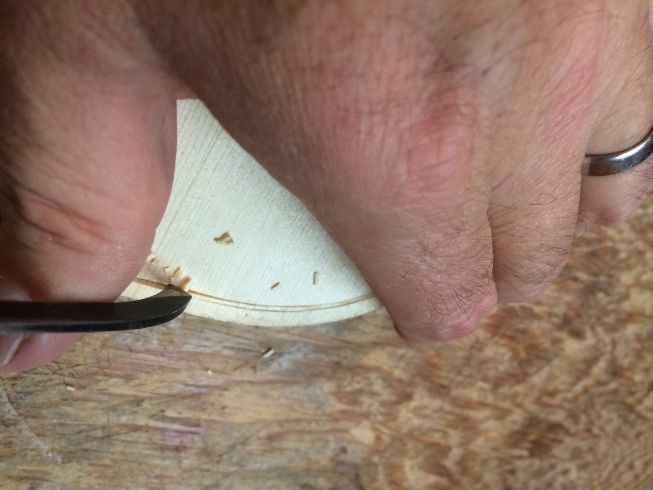 So, I went ahead and cut out those f-holes, using an f-hole “drill” my children bought for me, and an X-acto knife. 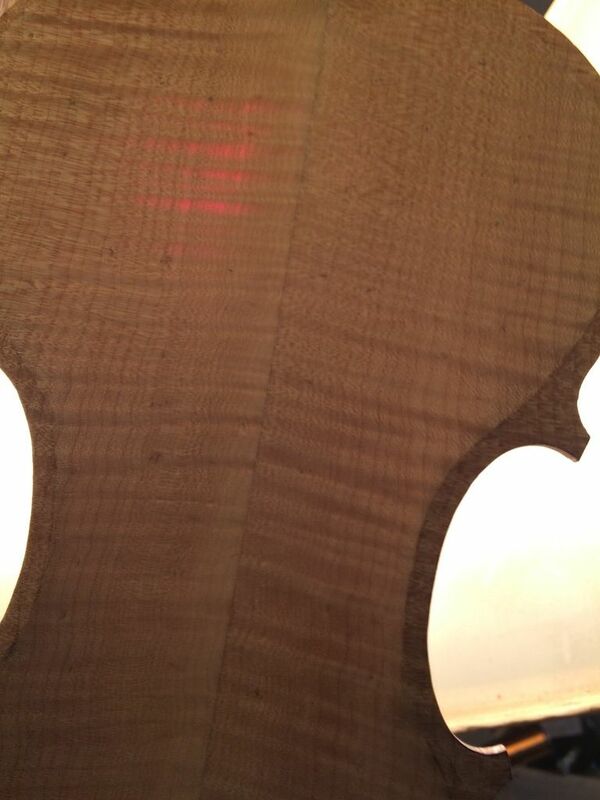 F-holes cut out and ready for the bassbar…outside view. 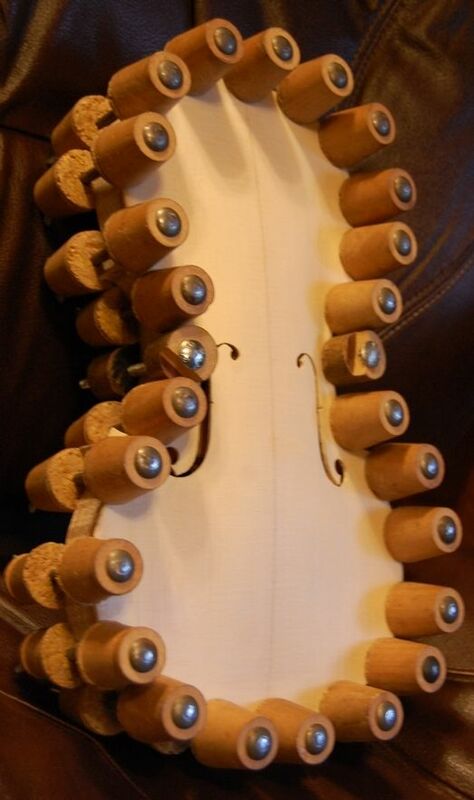 They still will require a good deal of refinement. 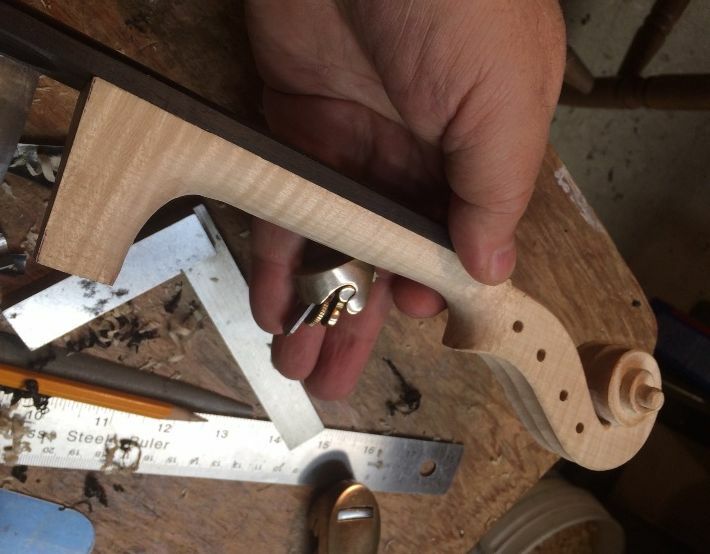 Then I chalk-fit a bassbar blank, and glued it in place, using special clamps made by Jake Jelley, the friend who encouraged me to continue building instruments. 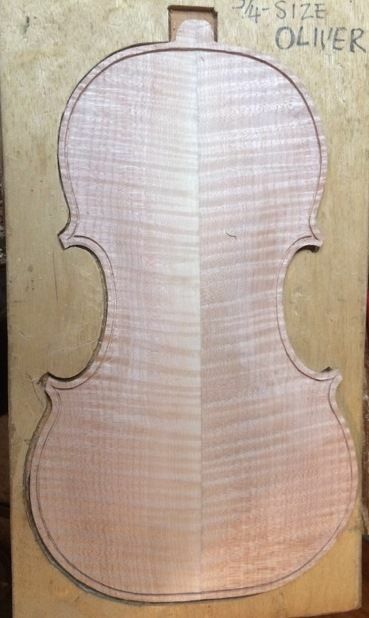 Bassbar blank with clamps. 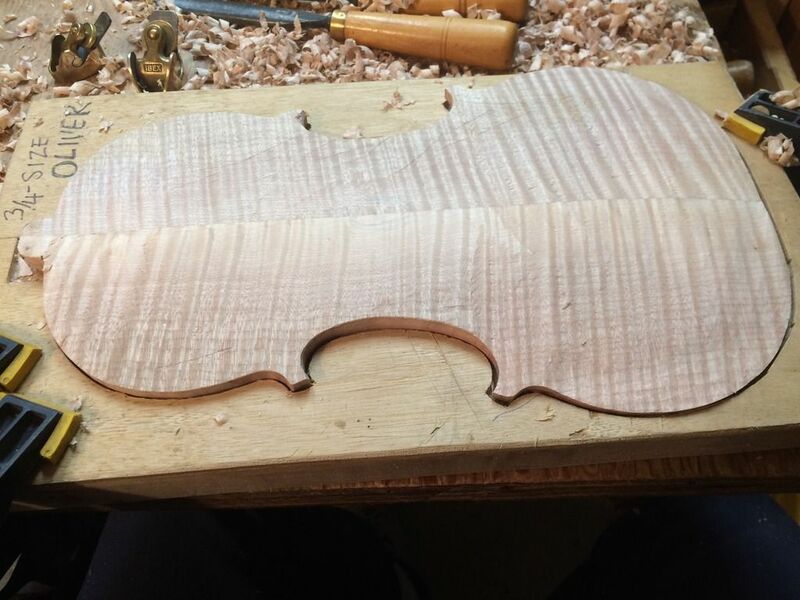 You can see the f-holes cut out…they still need more trimming. 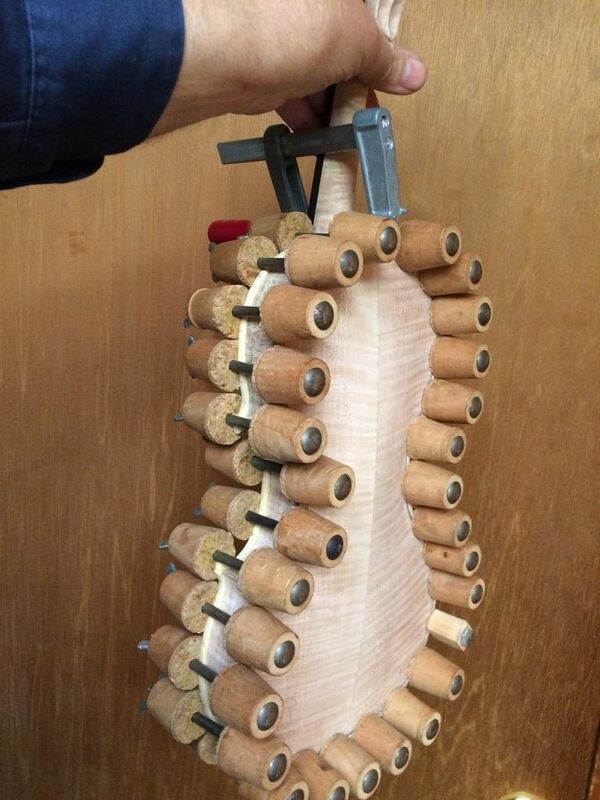 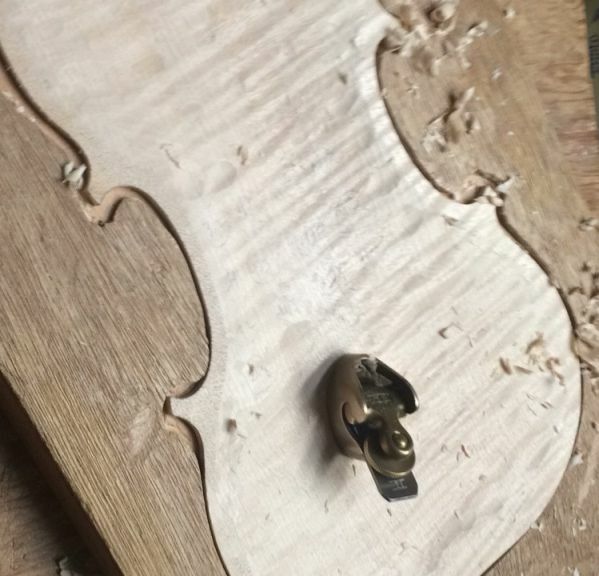 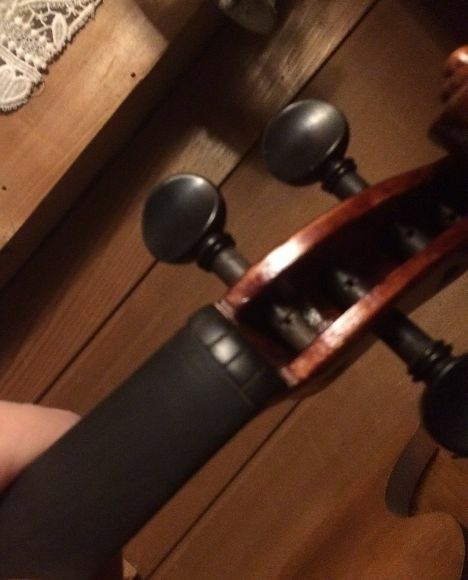 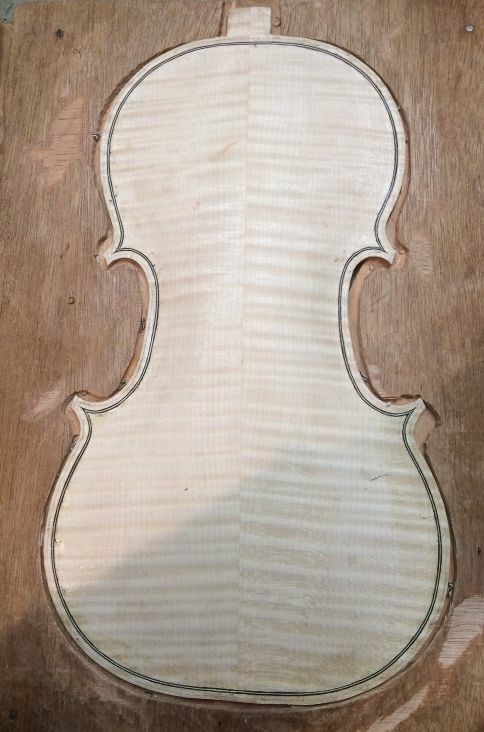 I carved and planed and scraped the bassbar into what I judged to be an appropriate shape for this instrument. 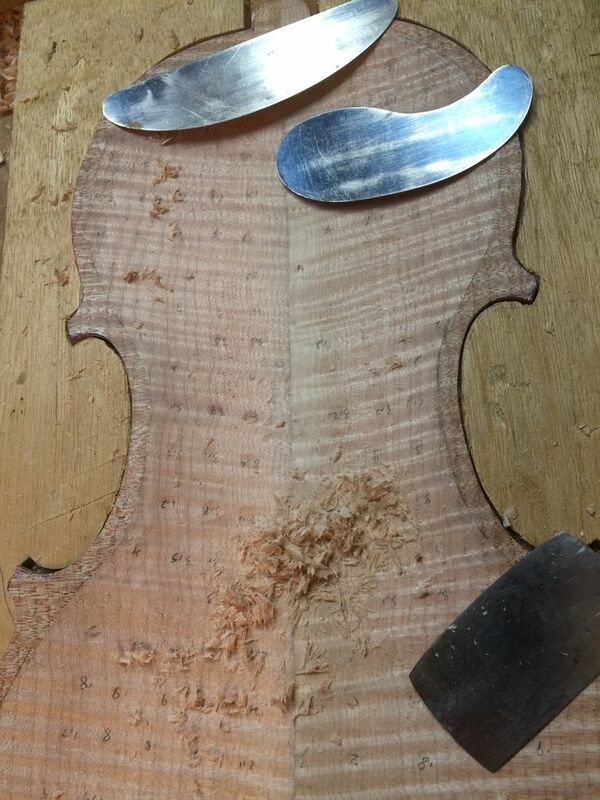 Both it and the f-holes will receive a bit more scraping and shaping before they are varnished. 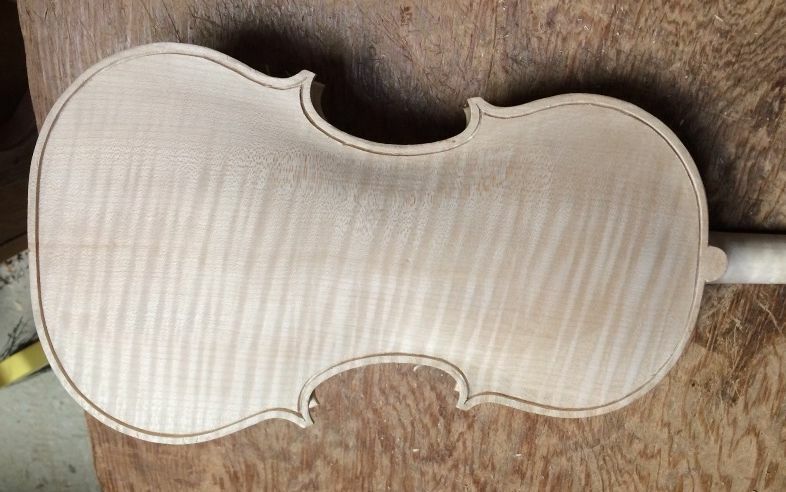 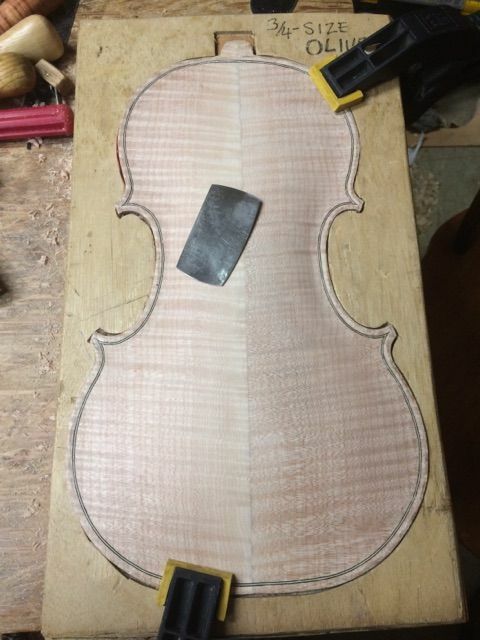 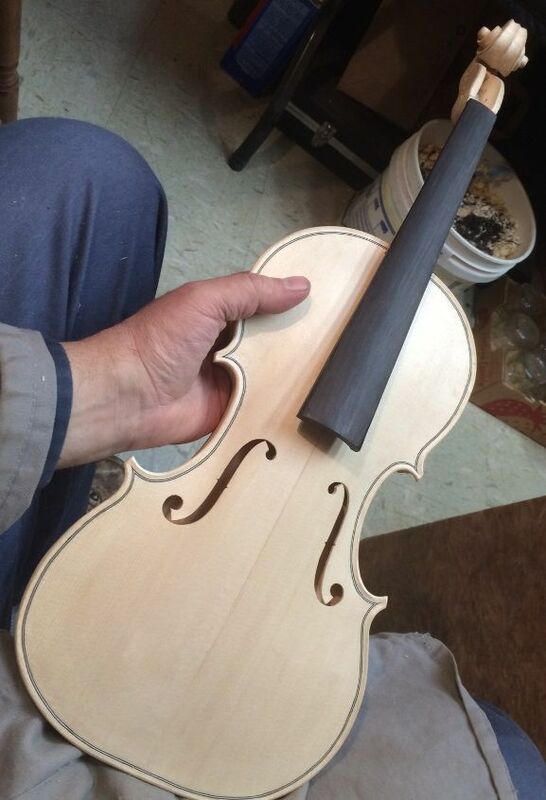 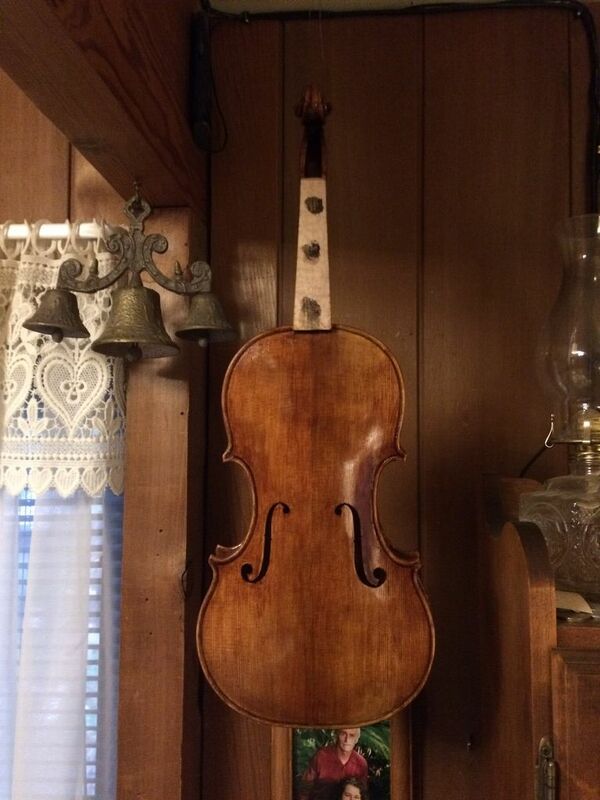 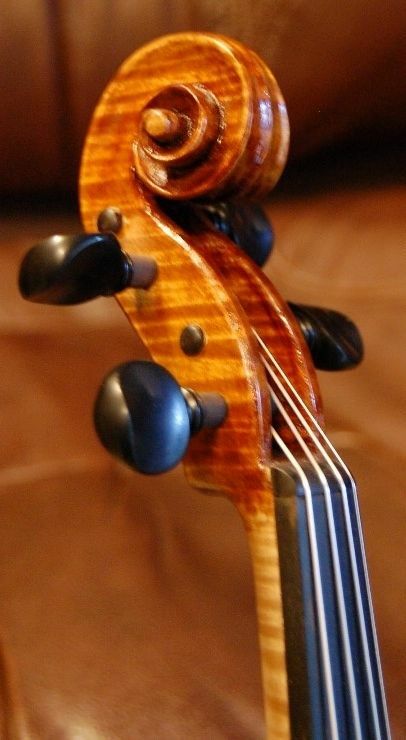 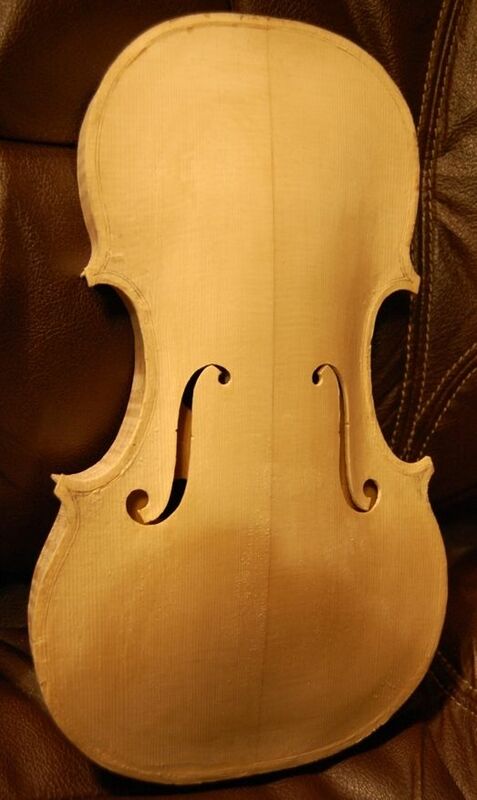 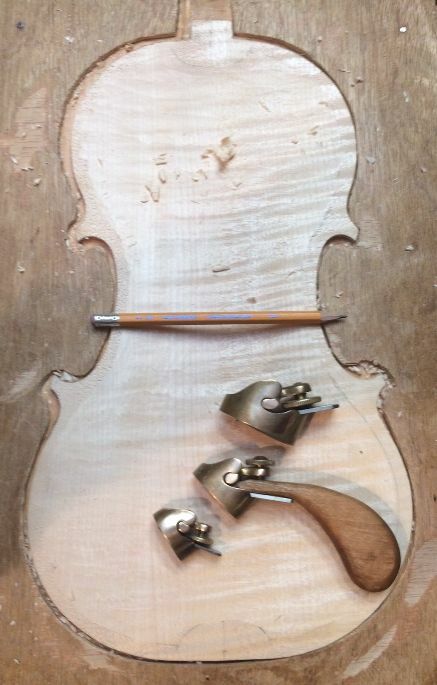 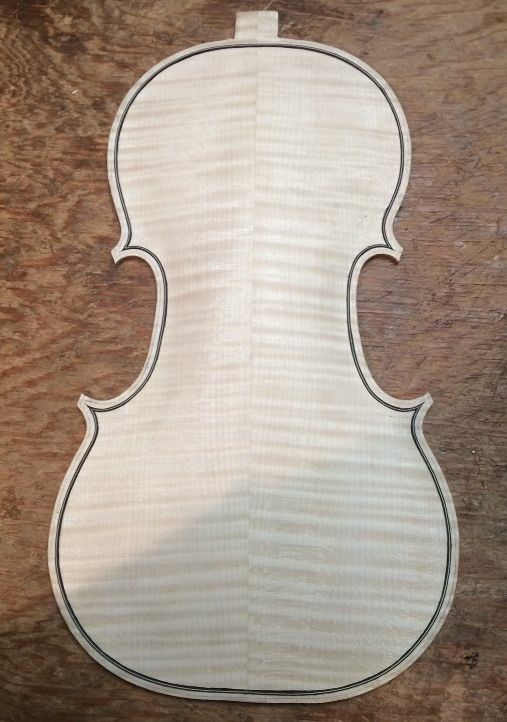 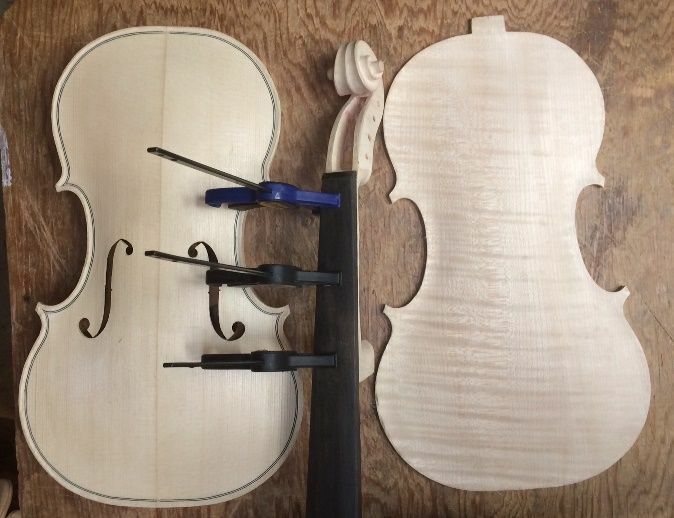 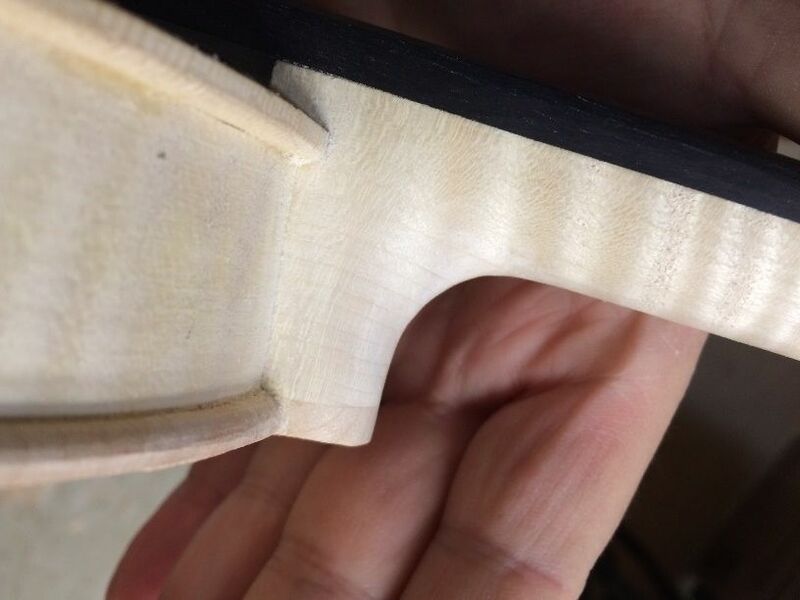 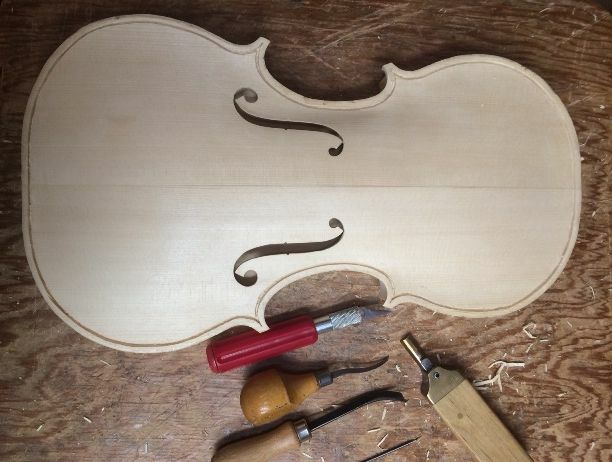 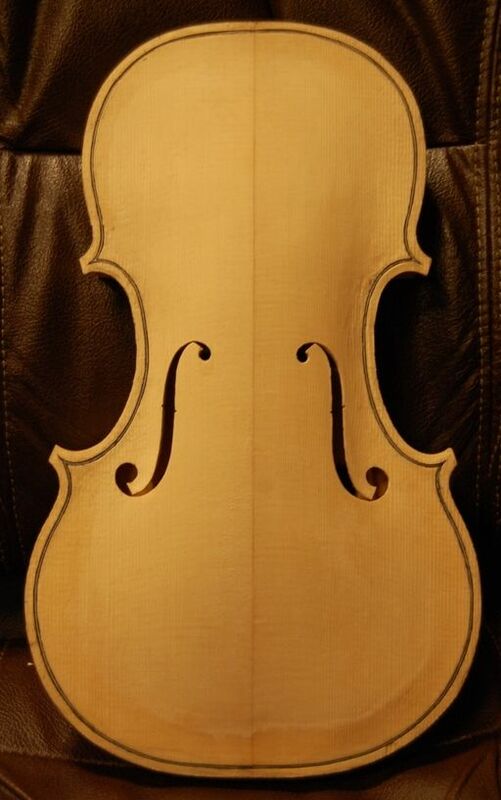 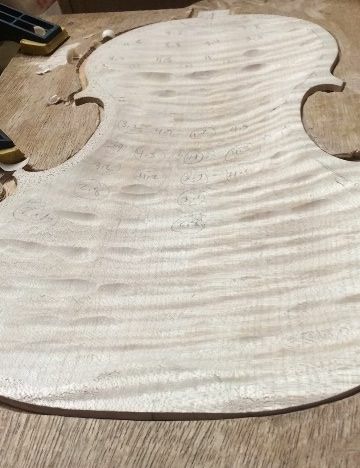 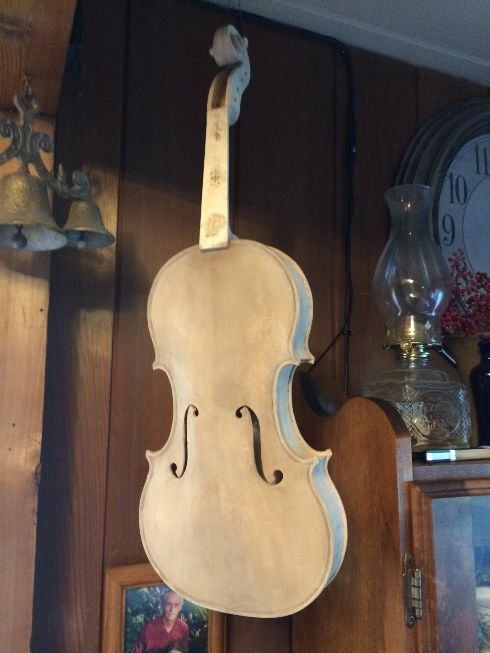 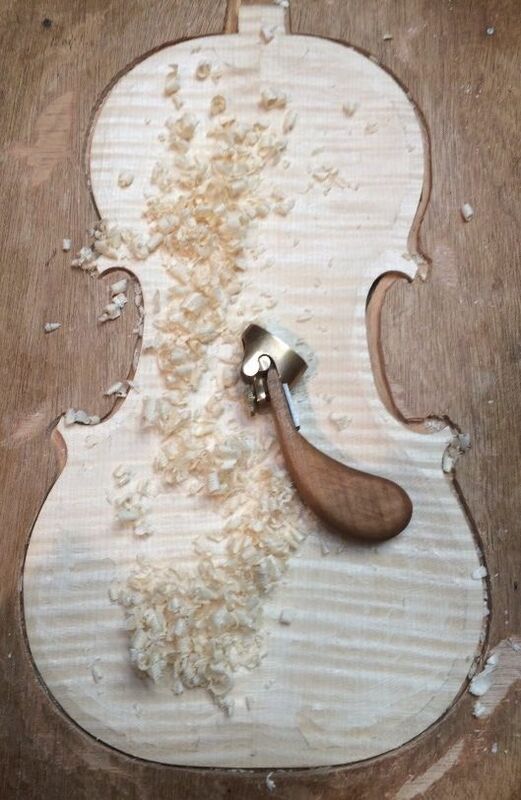 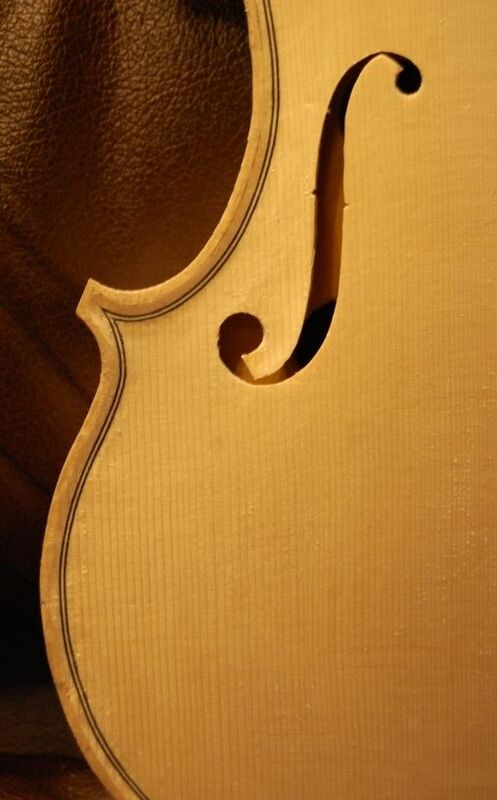 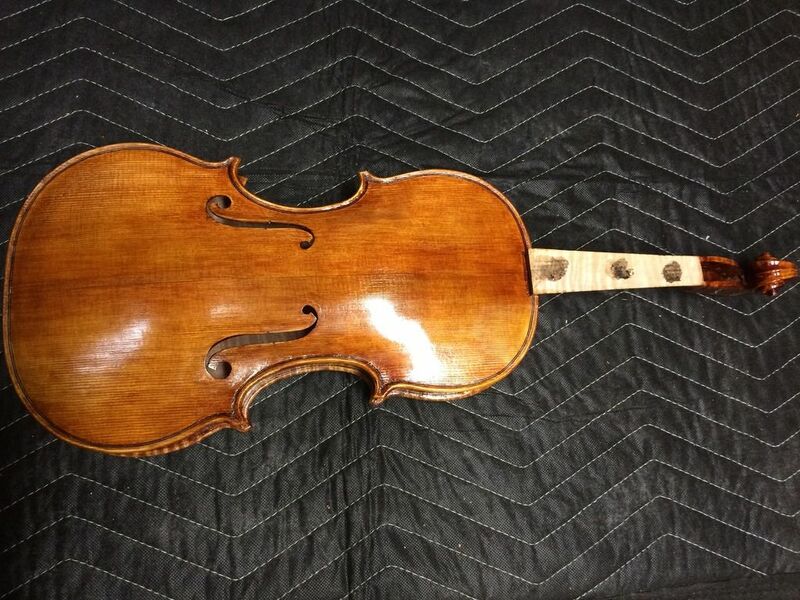 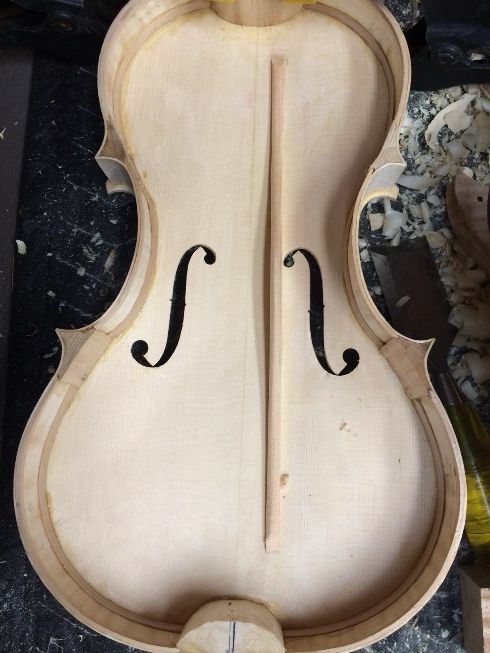 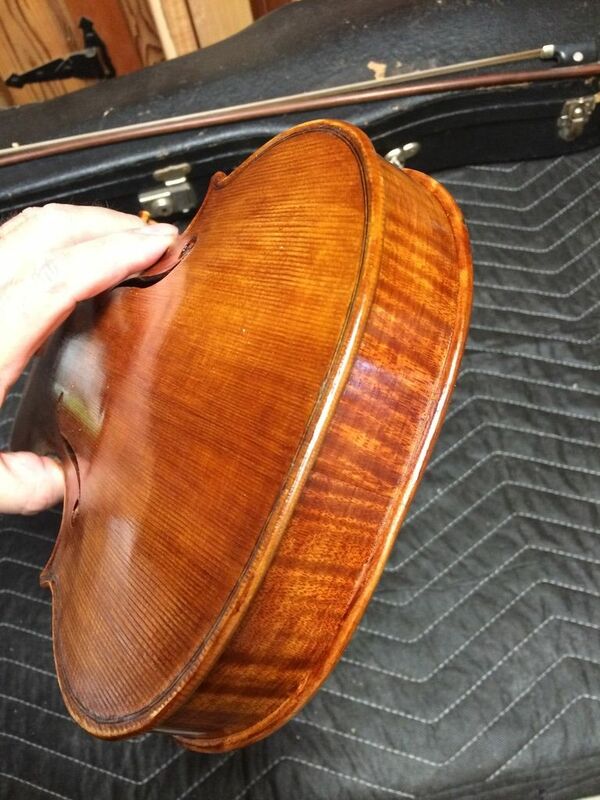 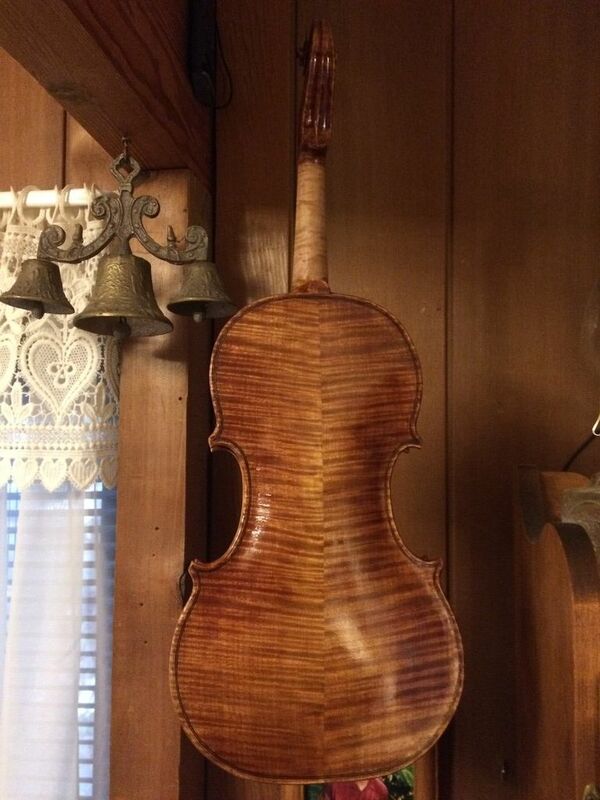 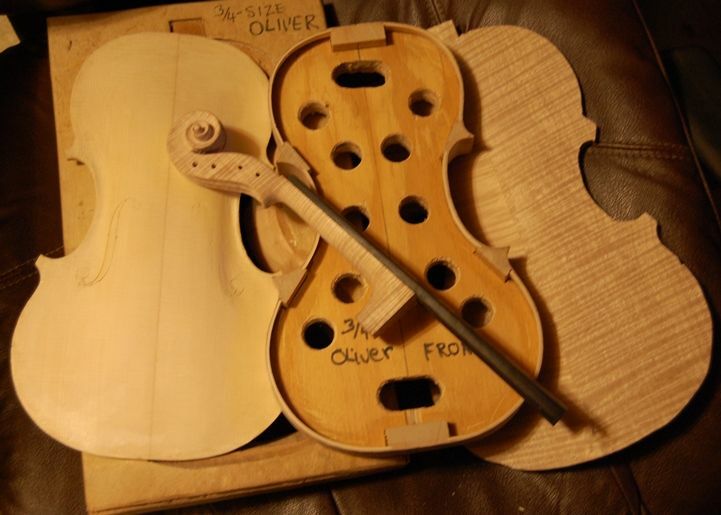 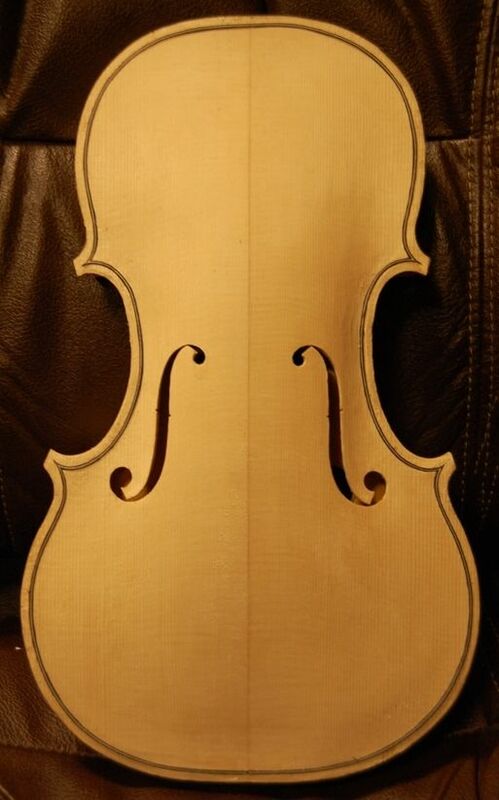 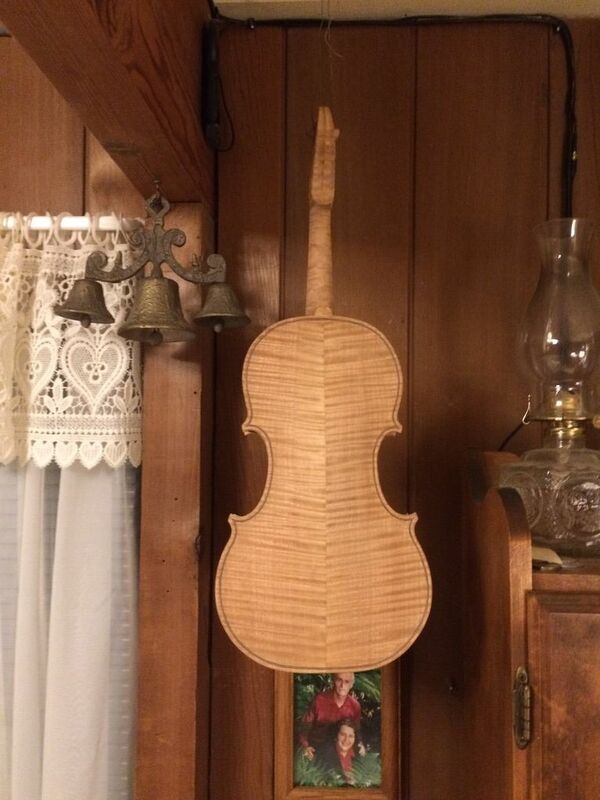 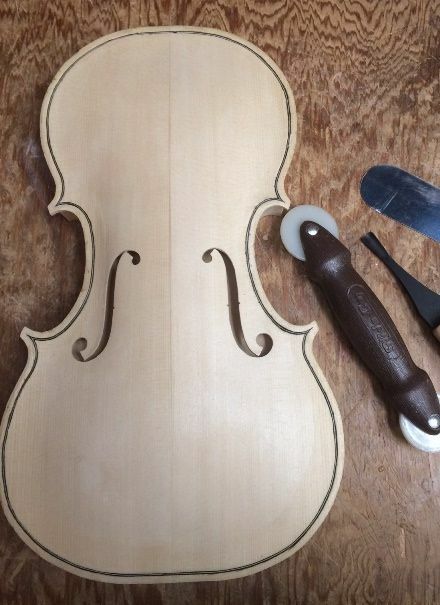 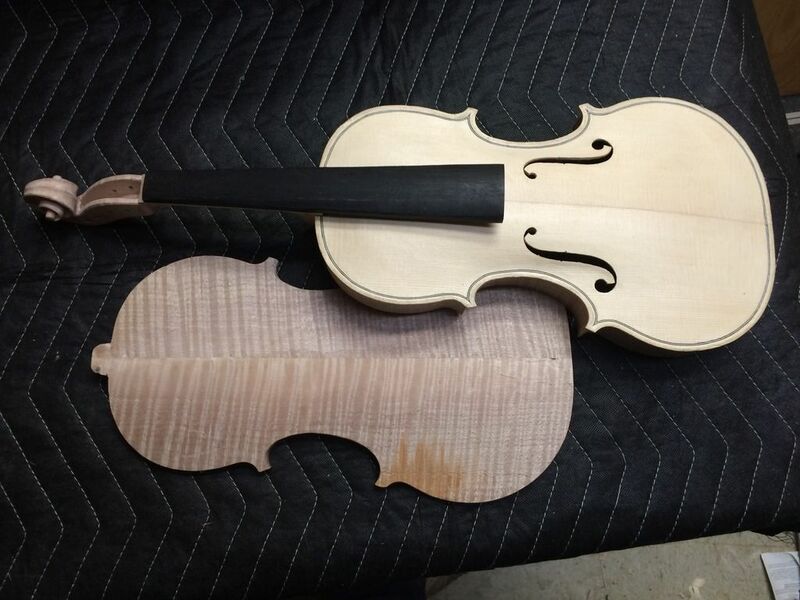 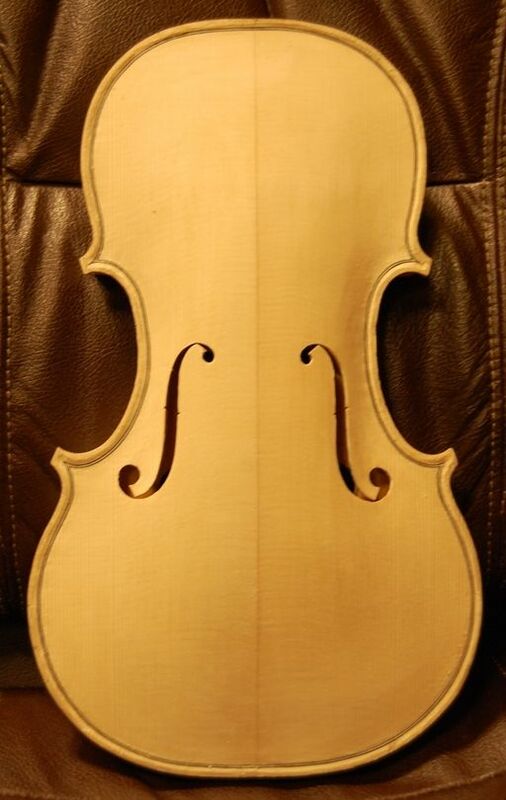 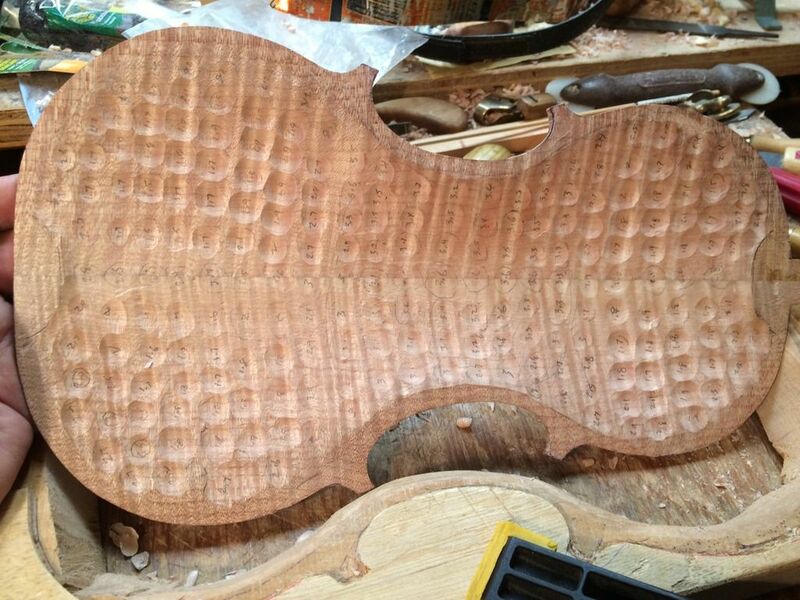 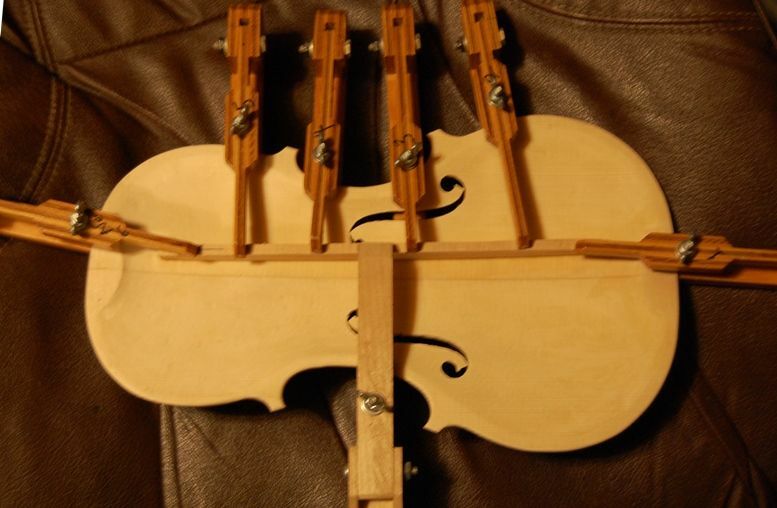 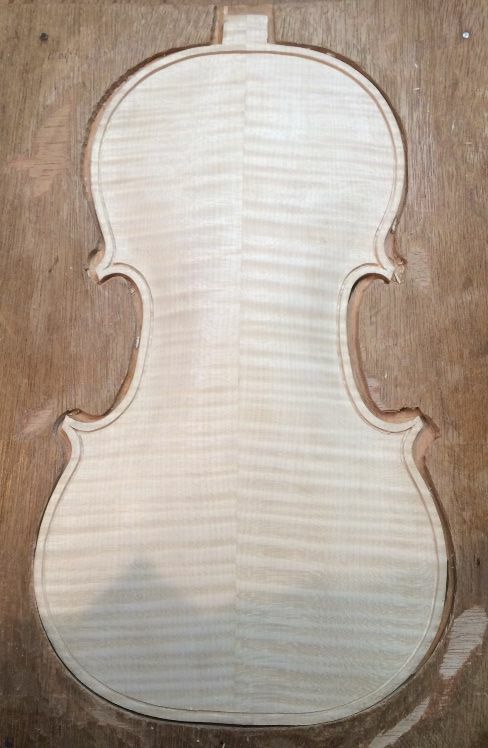 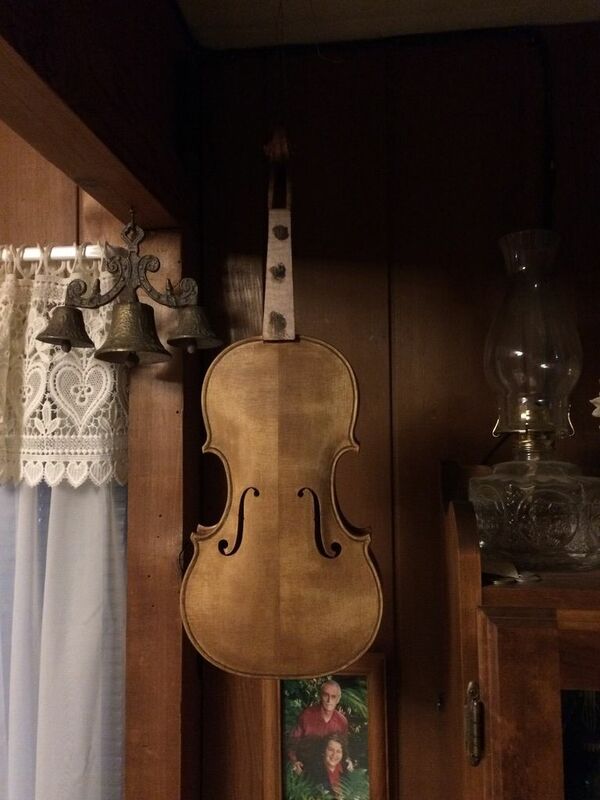 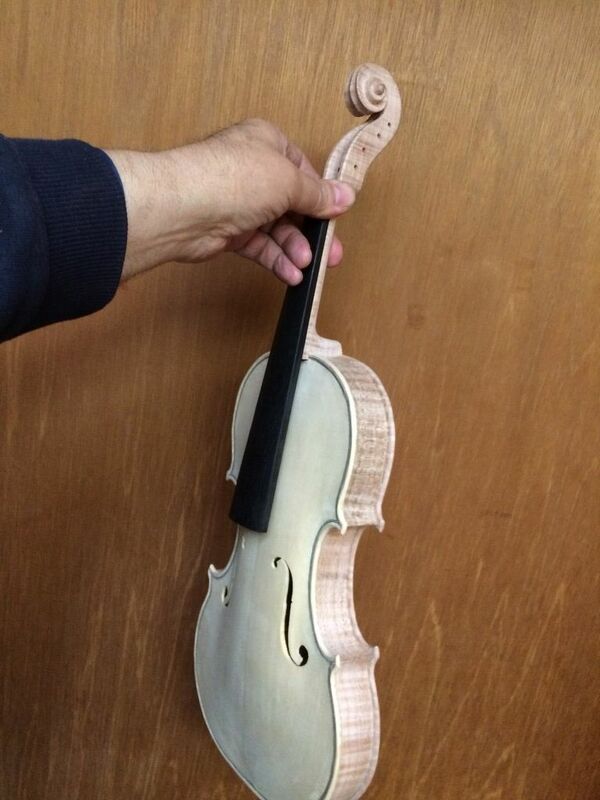 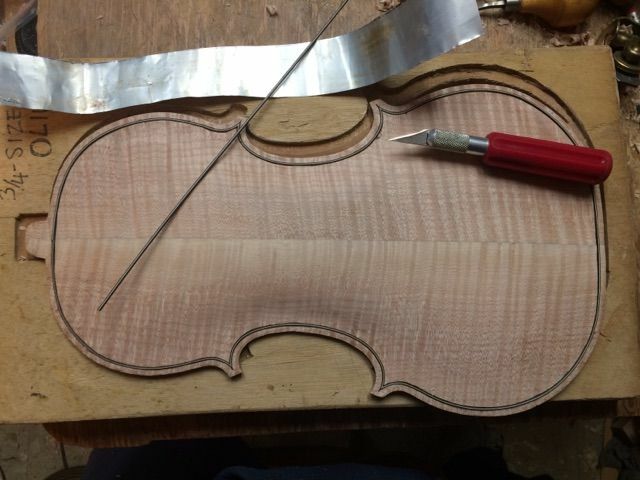 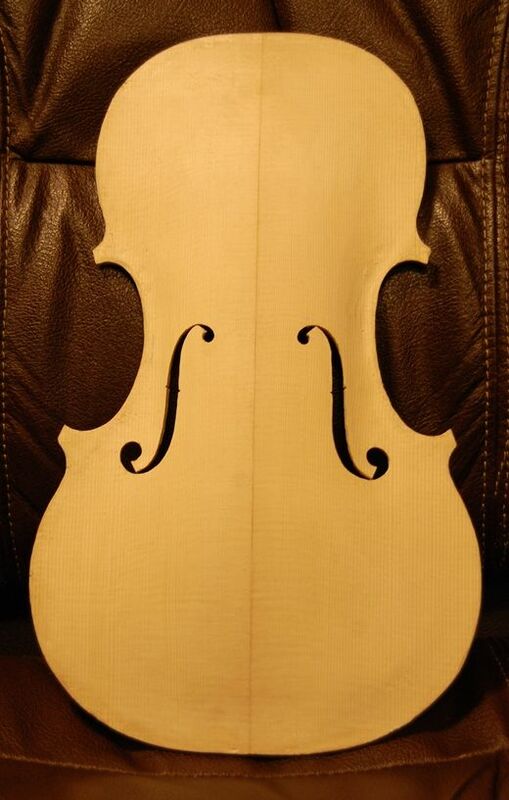 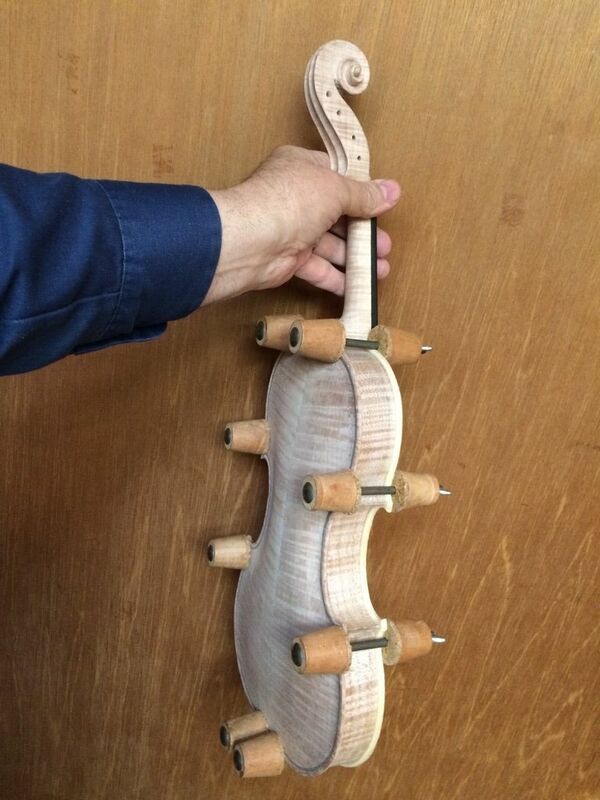 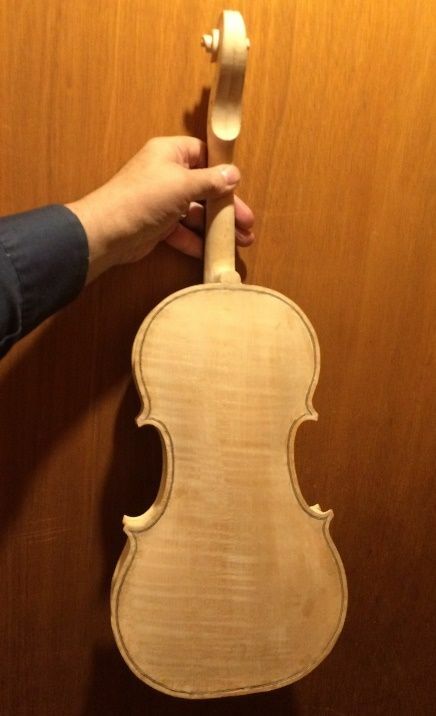 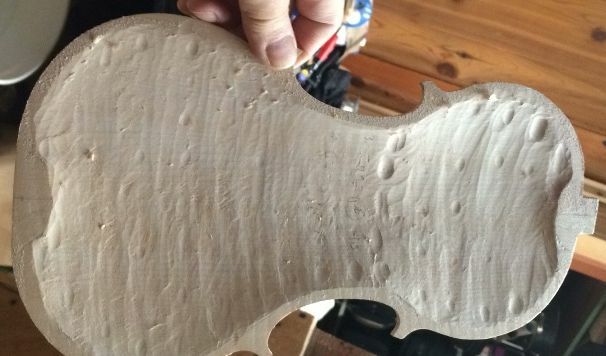 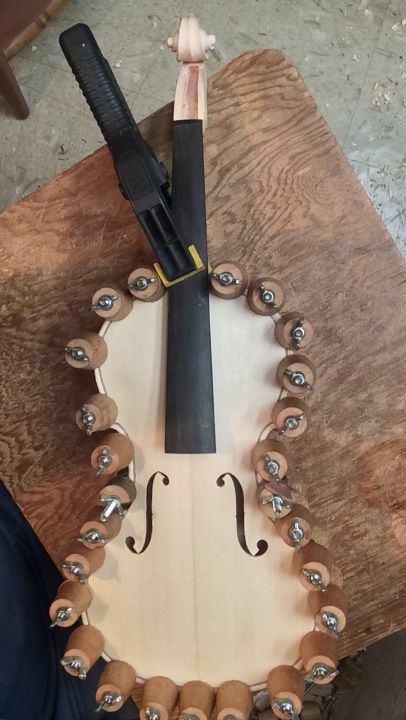 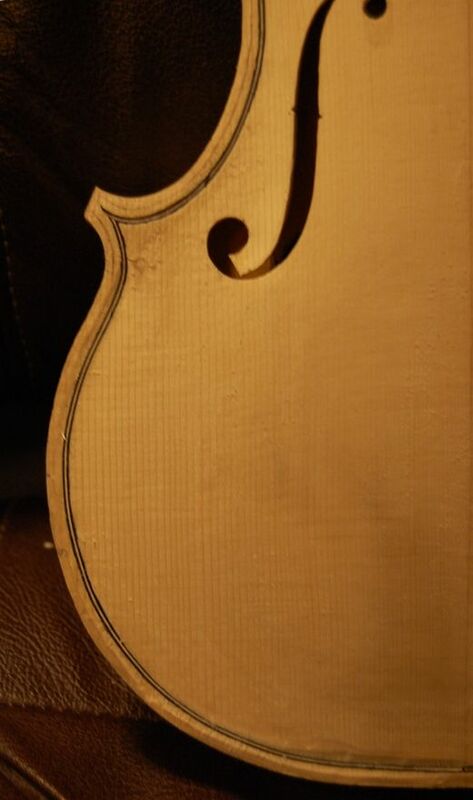 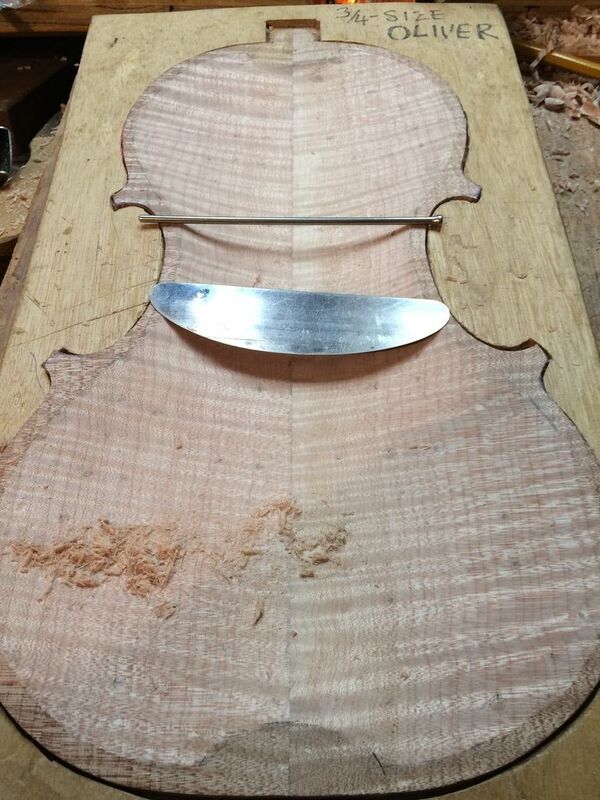 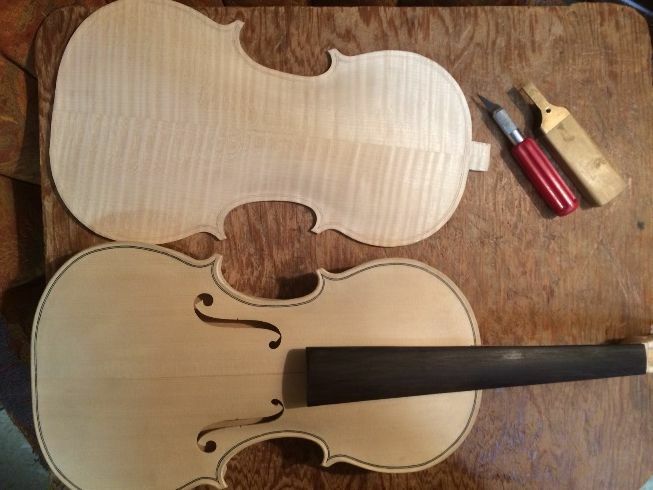 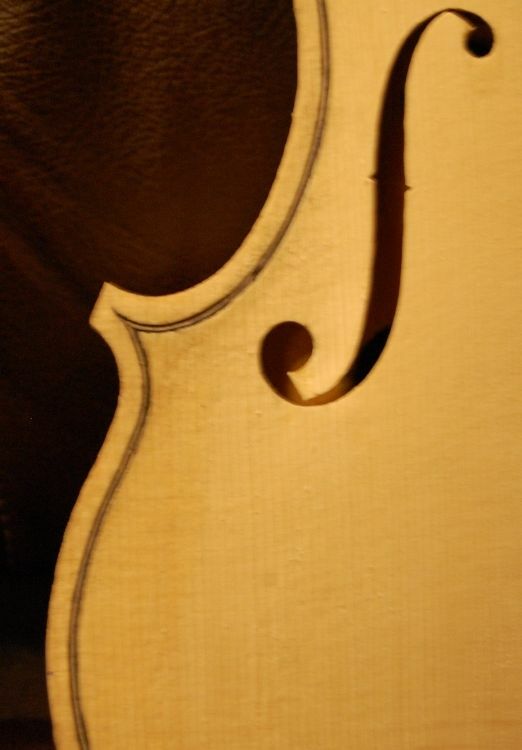 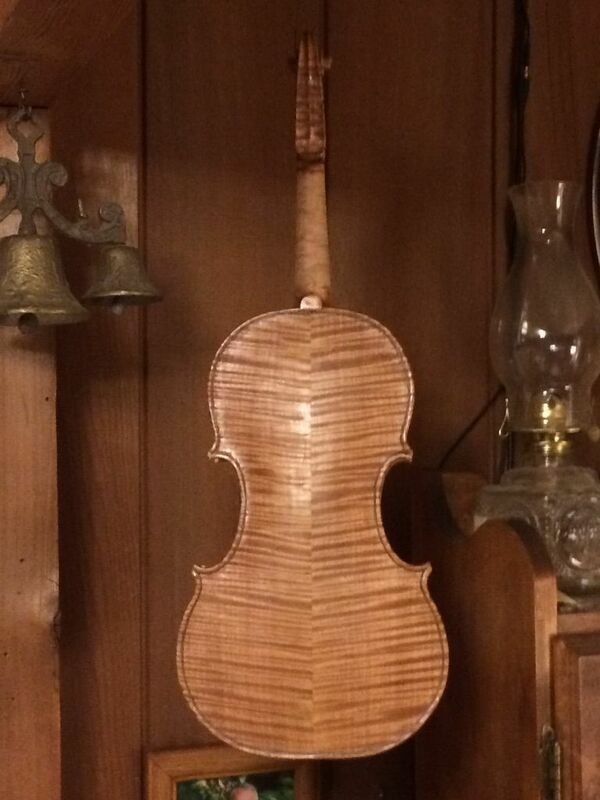 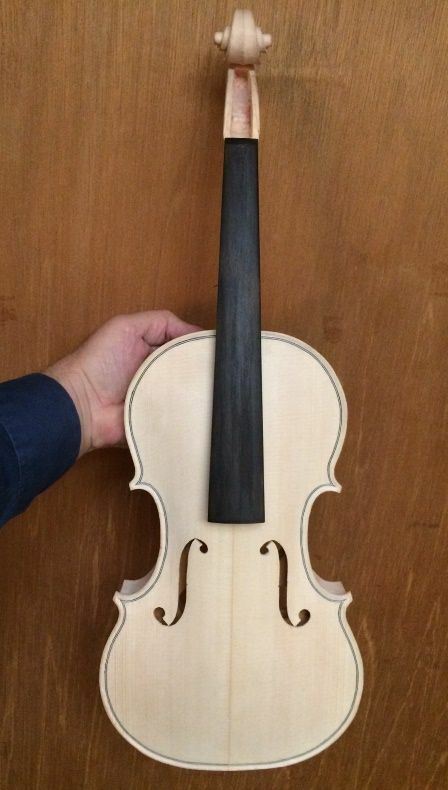 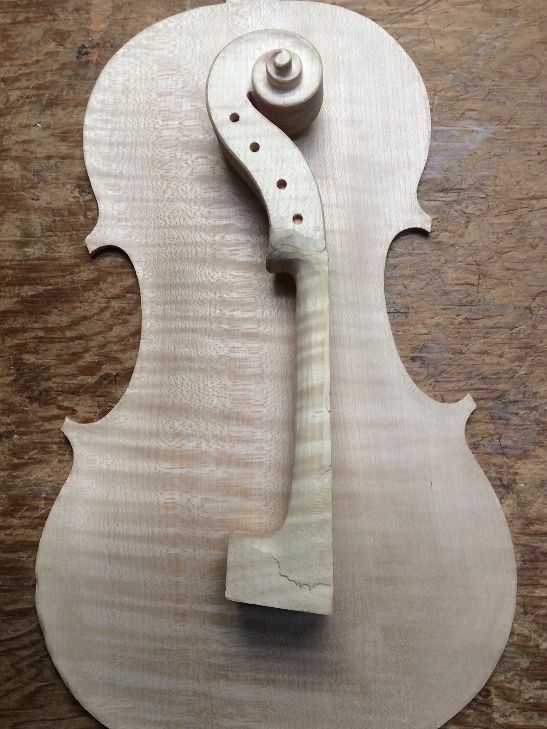 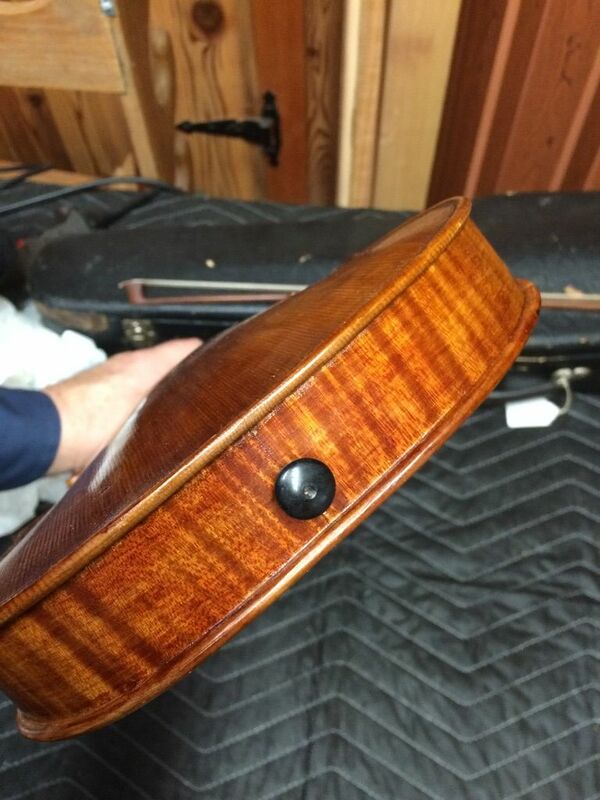 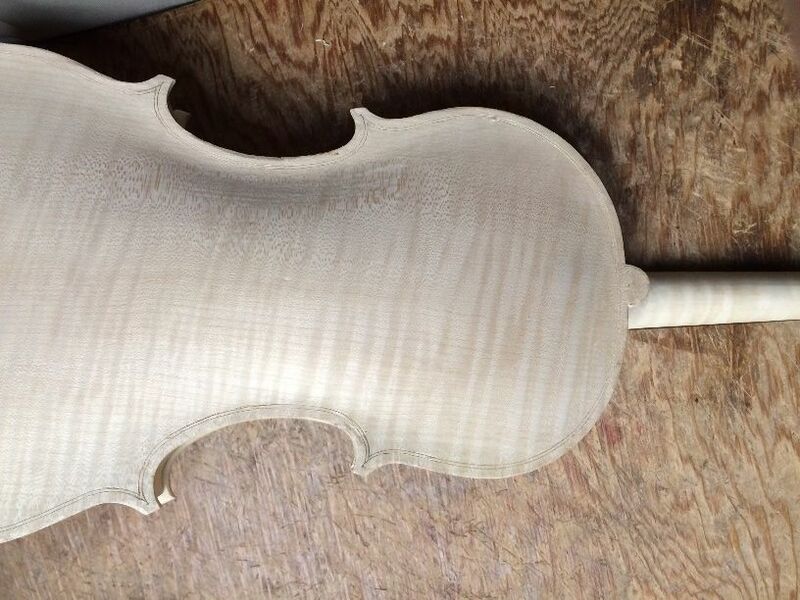 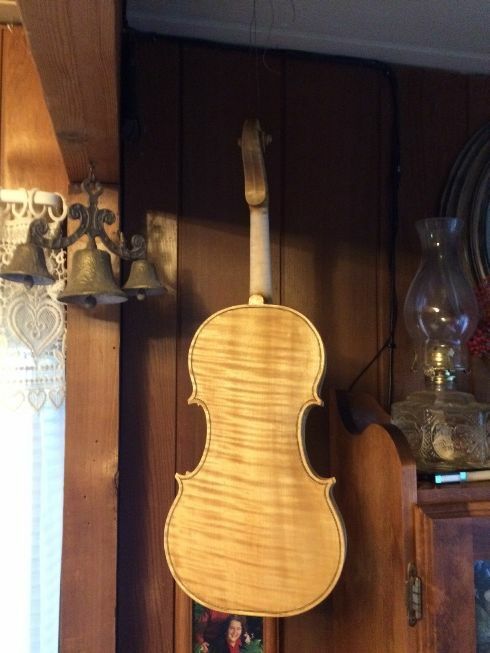 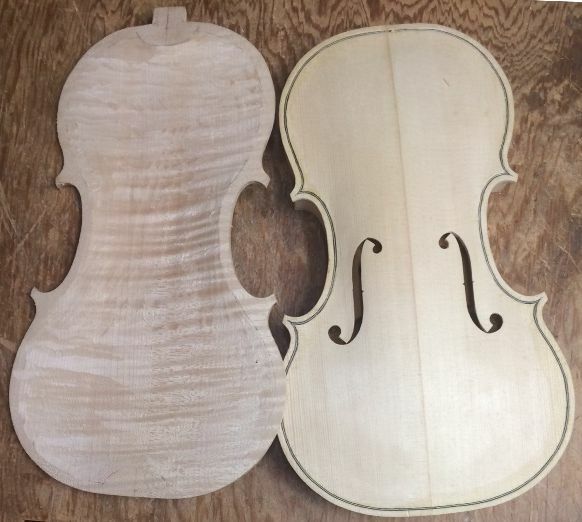 The whole instrument, actually, is fair game for tweaking, refining, and perfecting, until the varnishing begins. 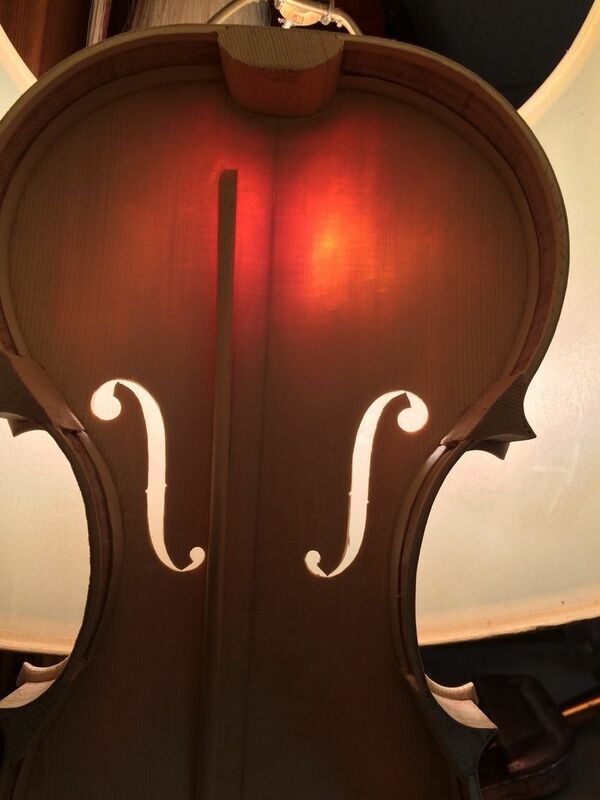 F-holes, bassbar and graduations nearly complete. 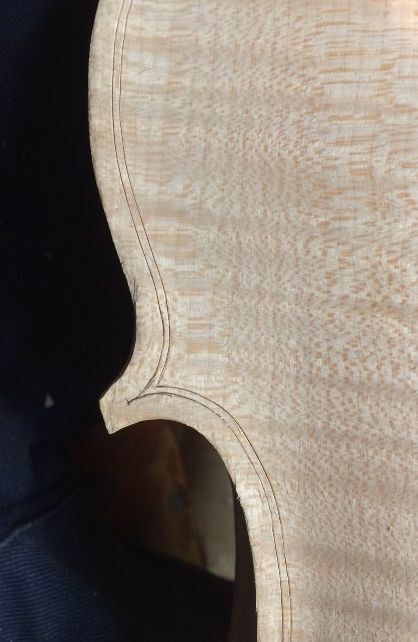 Outer edges have been rounded to approximate their final shape. 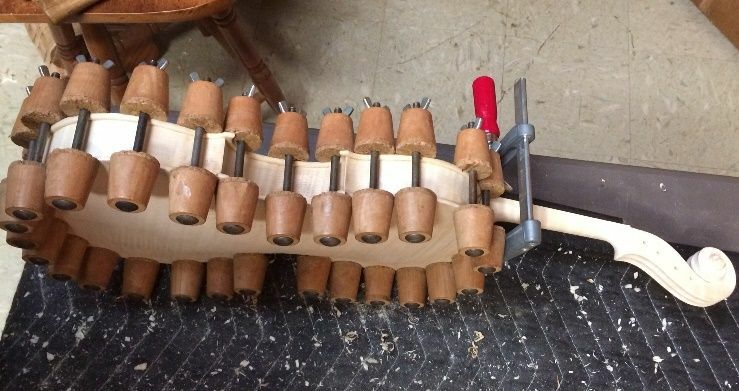 I aligned the front plate as closely as I could with the rib garland, and applied six spool clamps–one for each inner block. 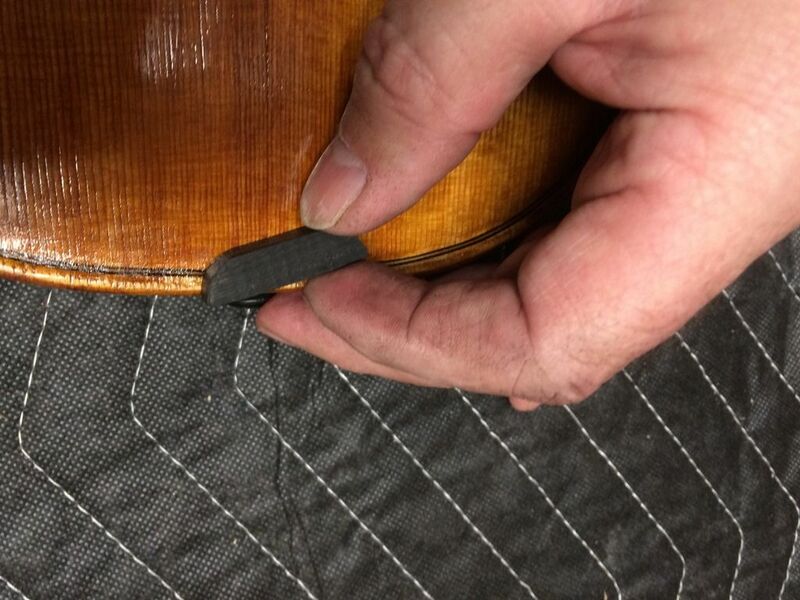 Then I loosened one clamp at a time, and, using a thin palette knife, I slipped hot hide glue between the plate and the blocks and linings. 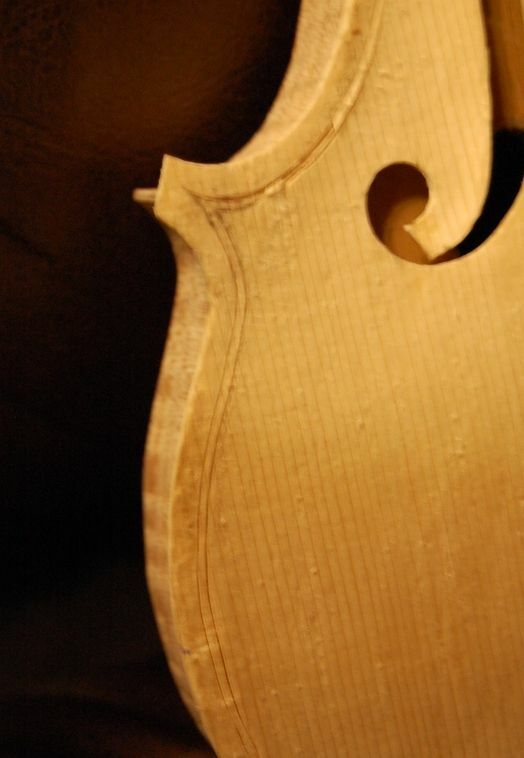 I rinsed the edge, overhang and rib quickly with hot water, and wiped it with a rag, then re-tightened the clamp, and added more clamps between that clamp and the next, repeating the procedure untill all the edges and especially all the blocks were securely glued and clamped, and relatively clean. 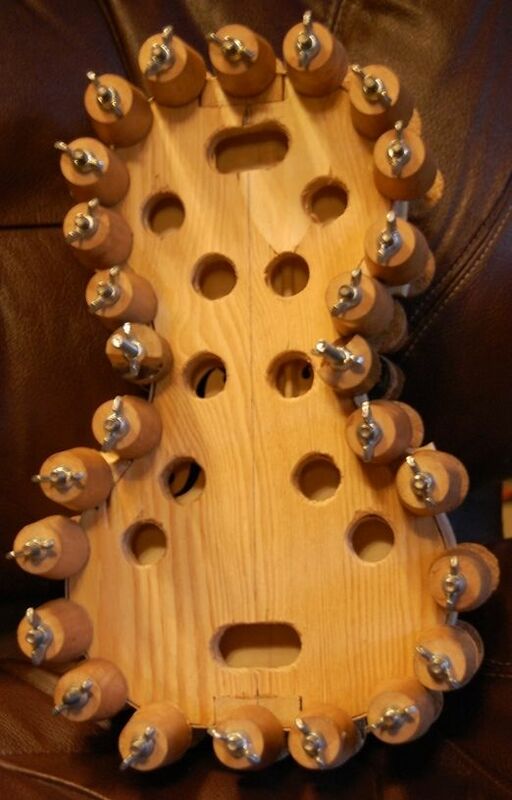 Back view of mold with front plate installed, and spool clamps. 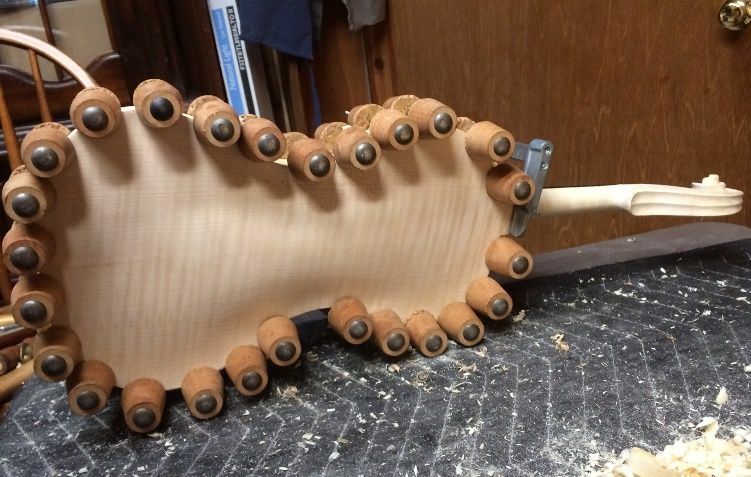 The mold will be removed after the neck is set. 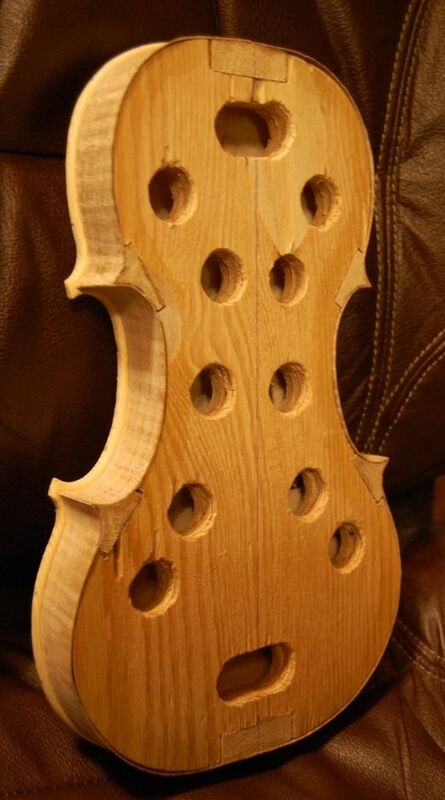 Not everyone does things in the same order. 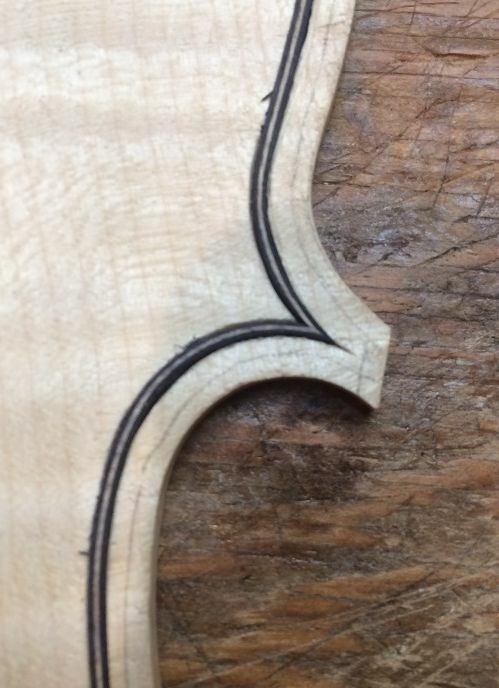 I have had trouble, in the past, getting my edge overhangs even all the way around. 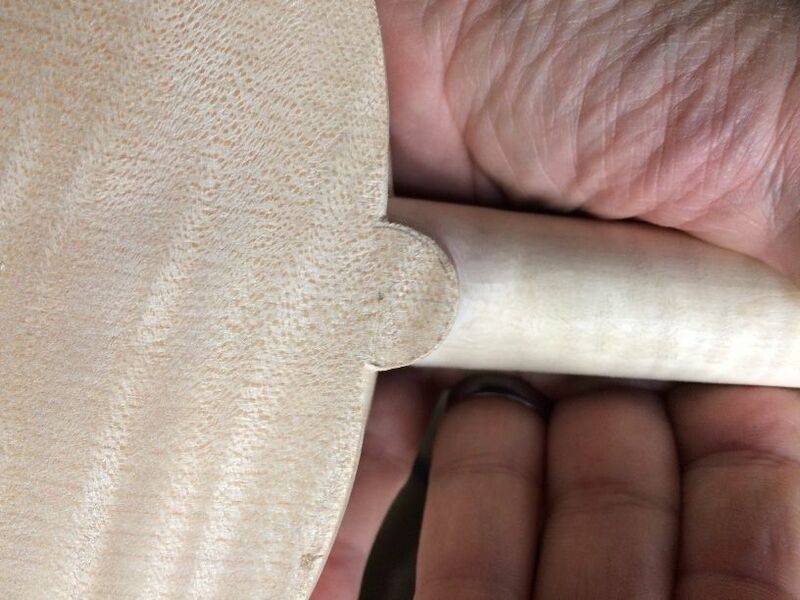 If I install the purfling first, then I am locked in, so to speak, and if the overhang is uneven, there is nothing much I can do. 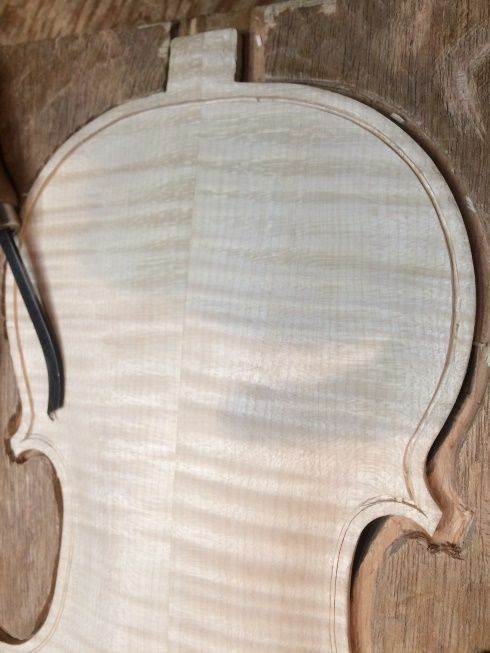 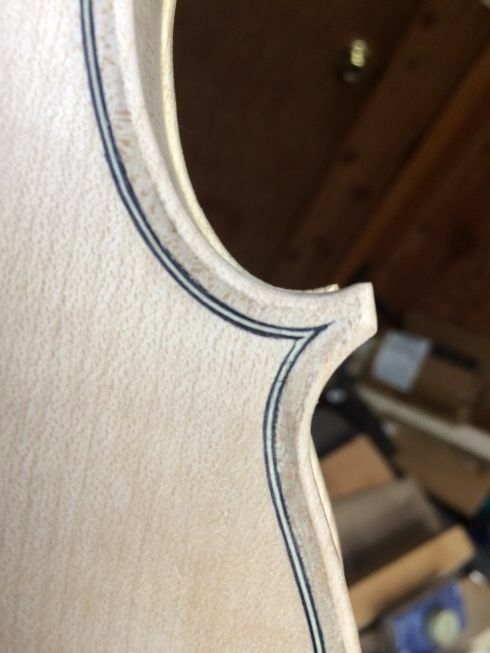 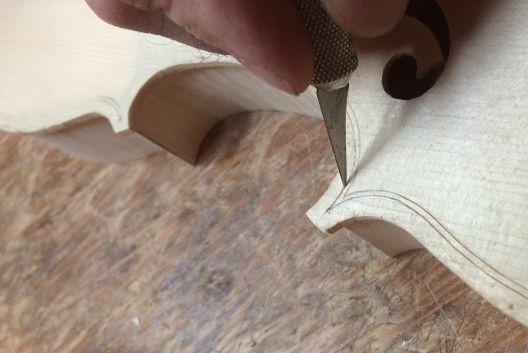 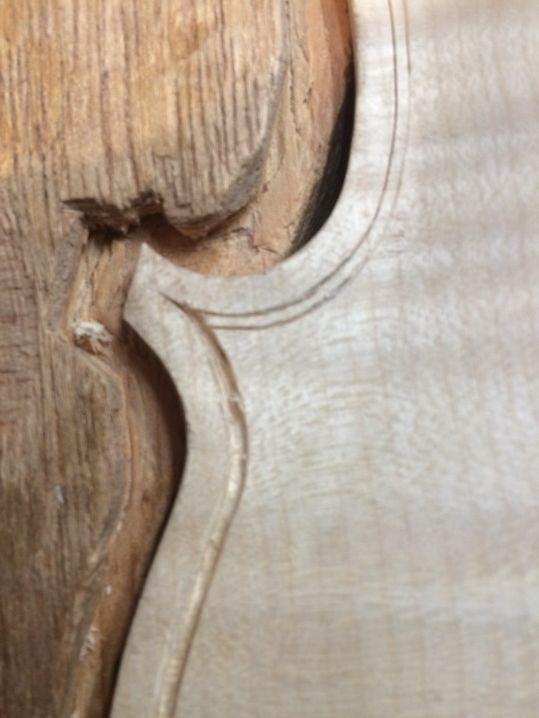 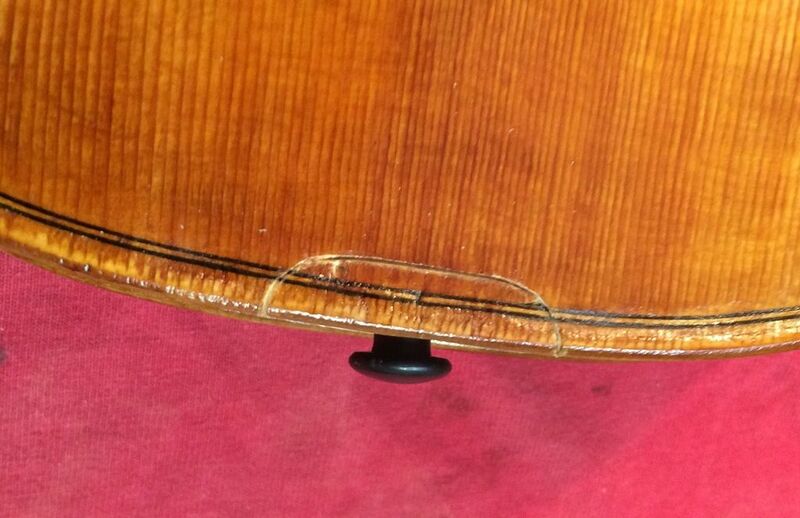 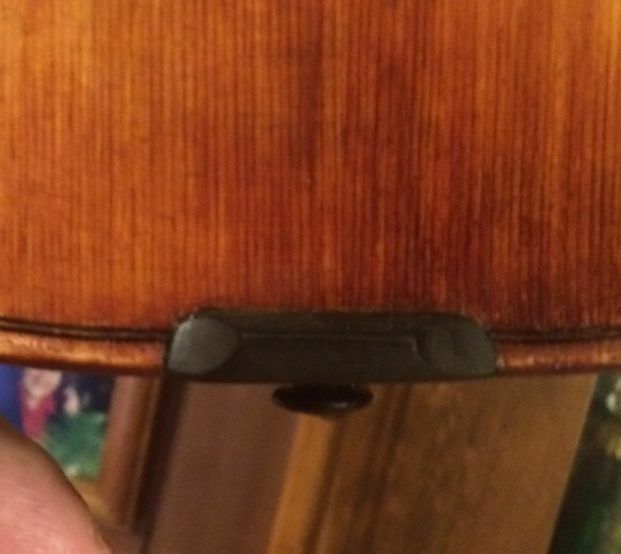 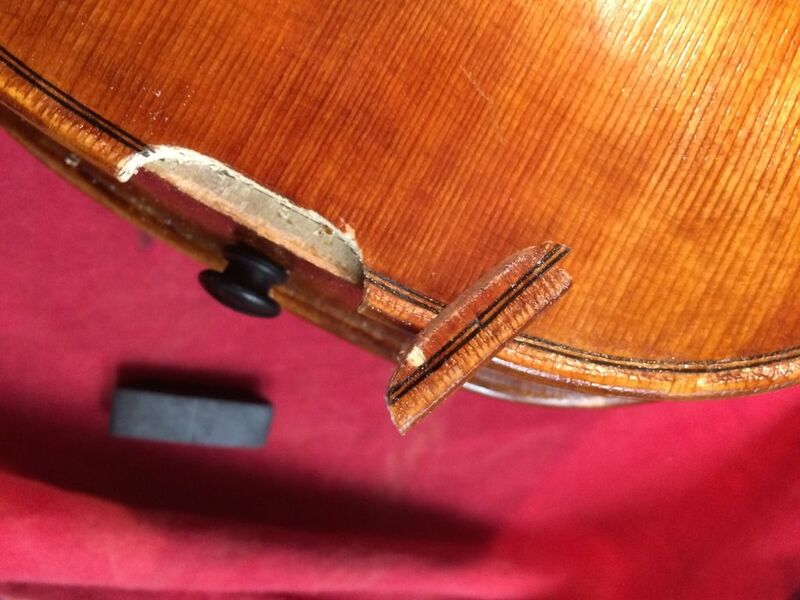 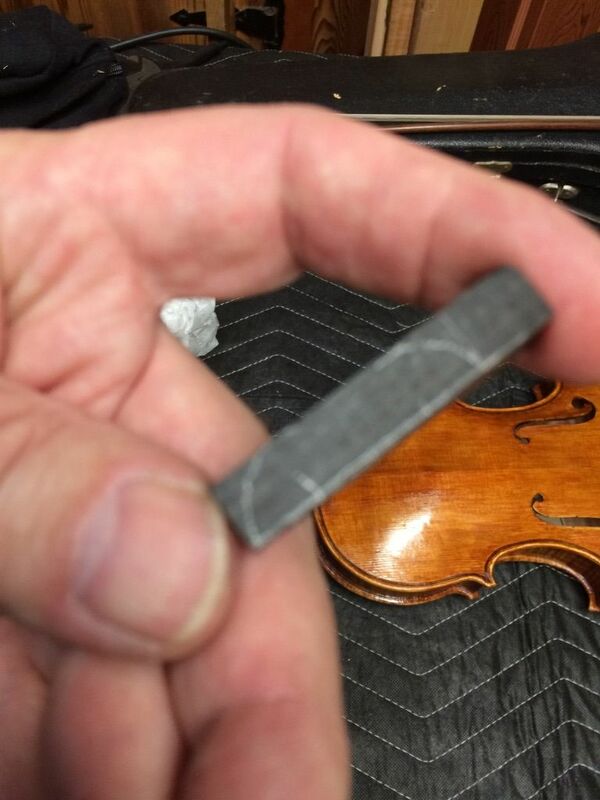 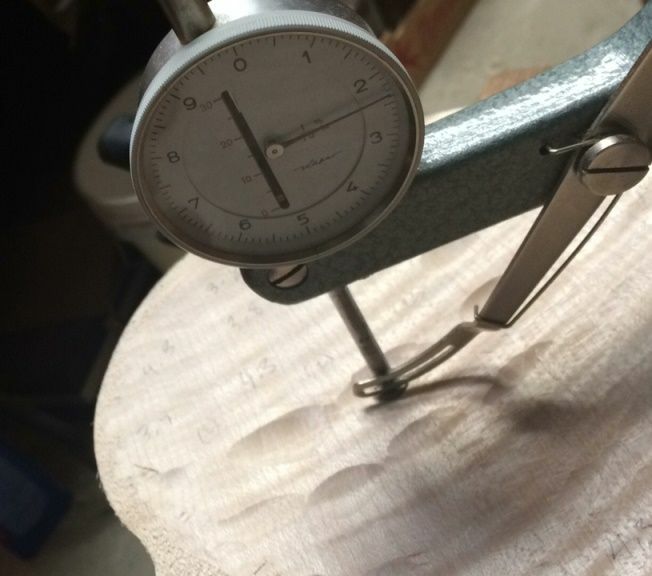 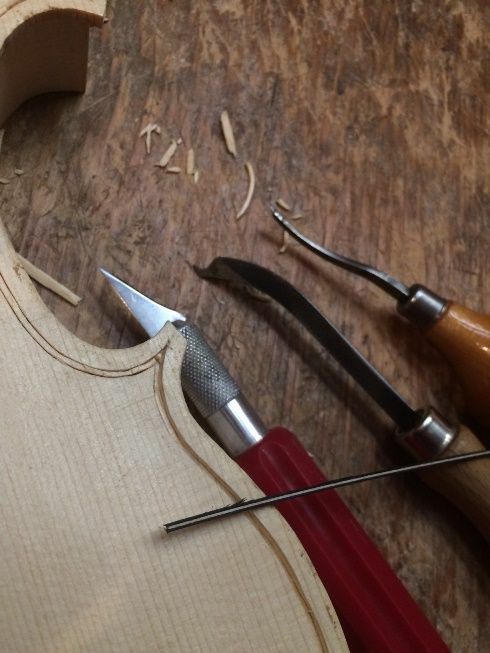 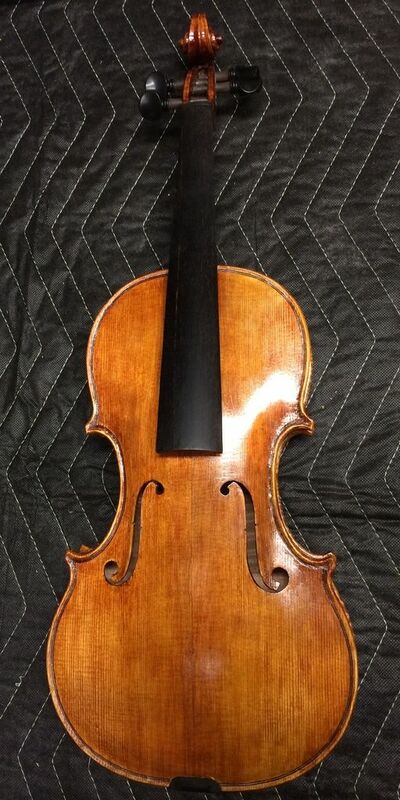 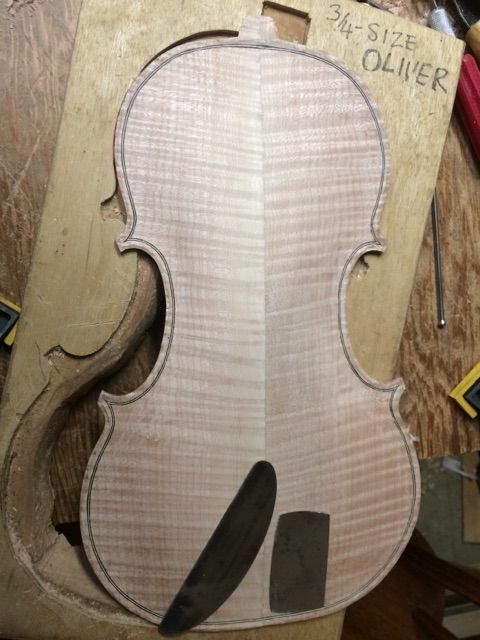 But if I purfle after installing the plate, I can take time first to adjust that overhang, using files and scrapers, until I am satisfied that it is the way I want it, and then purfle, following my adjusted edge shape. 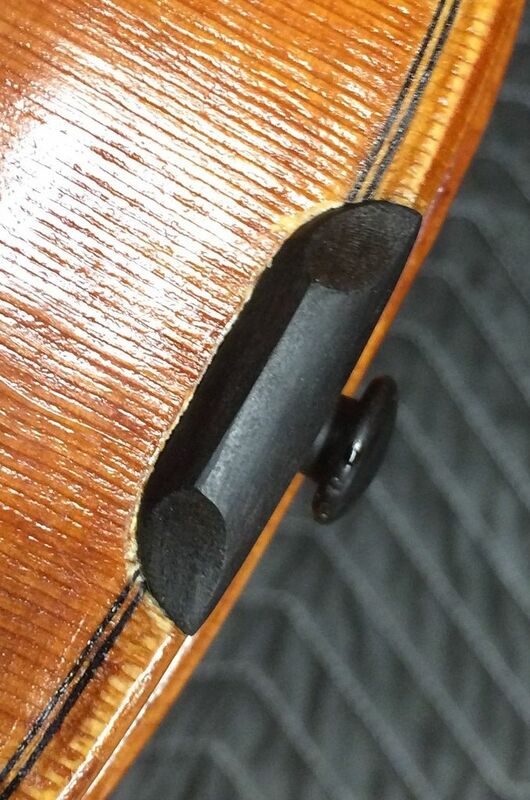 Installed front plate, from the mold side, showing the overhang. 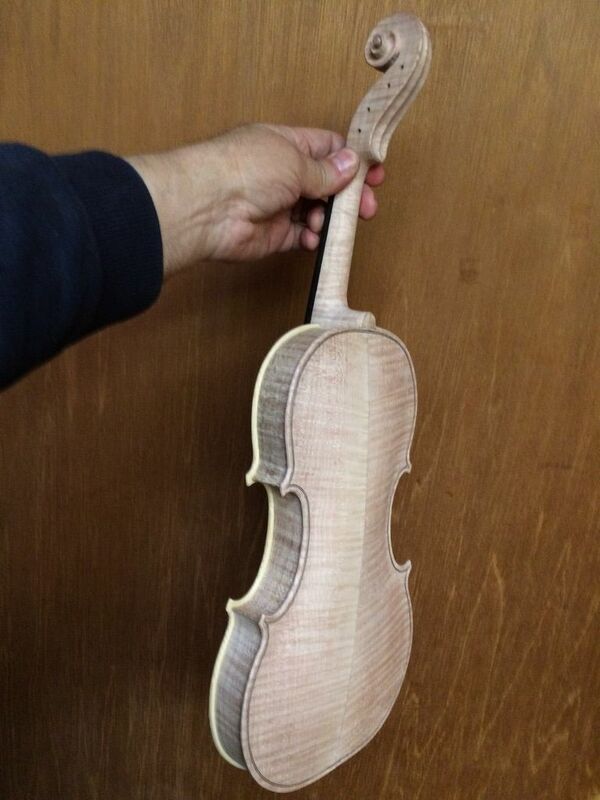 Notice that there are no back linings, yet. 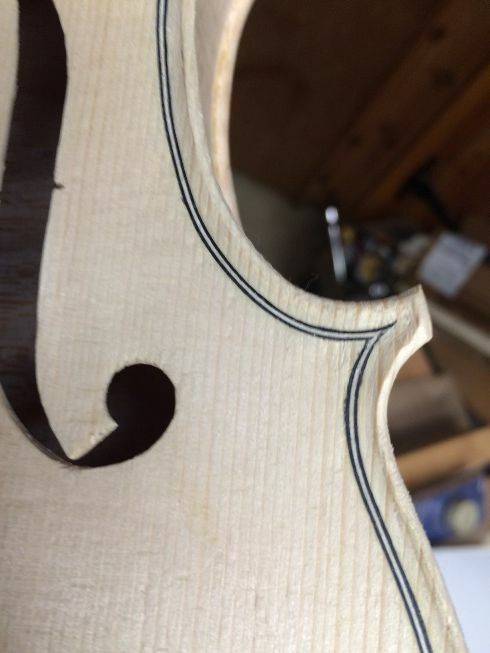 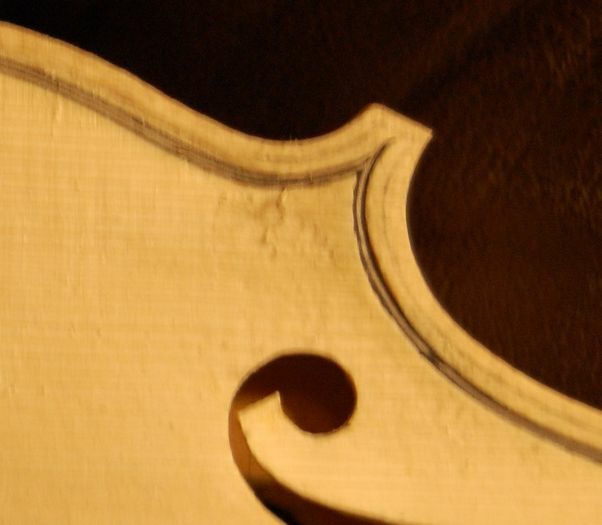 Close-up of the incised purfling lines. 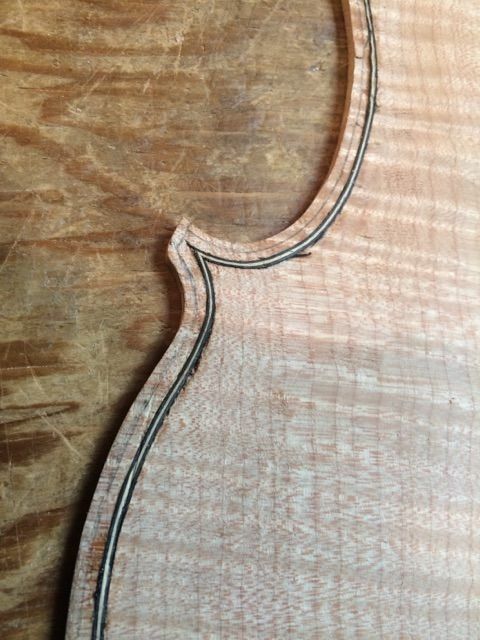 That corner will still undergo significant shaping and refining.